The Missouri Department of Transportation wants to widen I-70 between St. Louis and Kansas City. But as we’ve been reporting, many state DOTs just don’t have the money for major highway expansions anymore — and Missouri is no exception. Missouri’s state gas tax currently stands at 17¢ a gallon and has not changed since 1996. Let’s assume that the proposed gas tax increase first takes effect in 2013. Over the next 9 years, the state gas tax will almost double to 32¢. Assuming the status quo for other states, the new rate would place Missouri 16th, between Oregon and West Virginia. However, as shown [right], the picture looks much different when adjusting the value of the gas tax for inflation. In 1996, the state gas tax was worth 40% more than what its worth today. 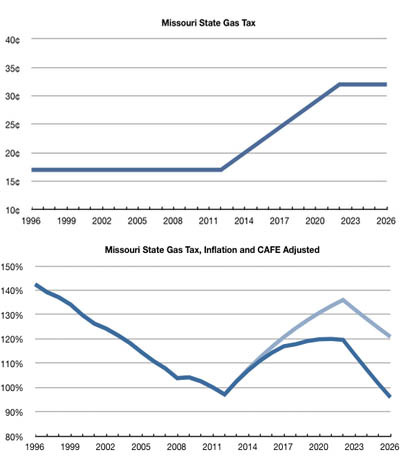 And despite MoDOT’s proposal to nearly double the gas tax, the 10 year timeframe means that inflation will keep the gas tax from ever reaching the value it had in 1996. Inflation, however, is but one of the major value depressors of the state gas tax. The other major depressor is the looming increase in CAFE standards. Per legislation signed by President Obama last July, the average fuel economy for cars and light-duty trucks is set to double from 27.5 mpg in 2008 to 54.5 mpg in 2025. Consequently, a 15¢ gas tax by itself is only just enough to fund MoDOT’s dream of I-70 truck only lanes from Kansas City to St. Louis. But, without additional sources of funding such as tolling revenue (or another major gas tax increase), MoDOT will be unable to invest in any other major projects for a long time to come. We just can’t afford to keep building highways where motorists drive for free. Maybe the right move for Missouri is to raise the gas tax and forget about this project. Elsewhere on the Network today: NRDC Switchboard explains what’s so great about the federal TIGER program. Brown Girl in the Lane explains why she thinks vehicular cycling is dangerous and its proponents deluded. And Riding in Riverside says that California’s planning and environmental review processes have become too lengthy and too vulnerable to interference by special interest groups. Will Missouri Voters Go Along With the Highway Lobby’s Money Grab?